Before catching the plane to Jordan, we had an interview with the Boulder Weekly Newpaper, they were interested in our trips to the Middle East, especially the one that we're planning to make now. On a mid-’60s mountaineering expedition through Peru and Bolivia, Cameron had become fascinated with Peru’s six million Incas, and returned to the United States to study anthropology and linguistics–specifically the Inca language–at the University of Colorado, Boulder. Back and better armed for what was his third tour, he struck out with a six-string upriver into a Heart of Lightness. "I walked through a village that was a three days walk from the end of the nearest road," Cameron recalls. "I was the first foreigner ever to enter that village. It was because I was carrying a guitar and I began singing music that I was accepted instantly." 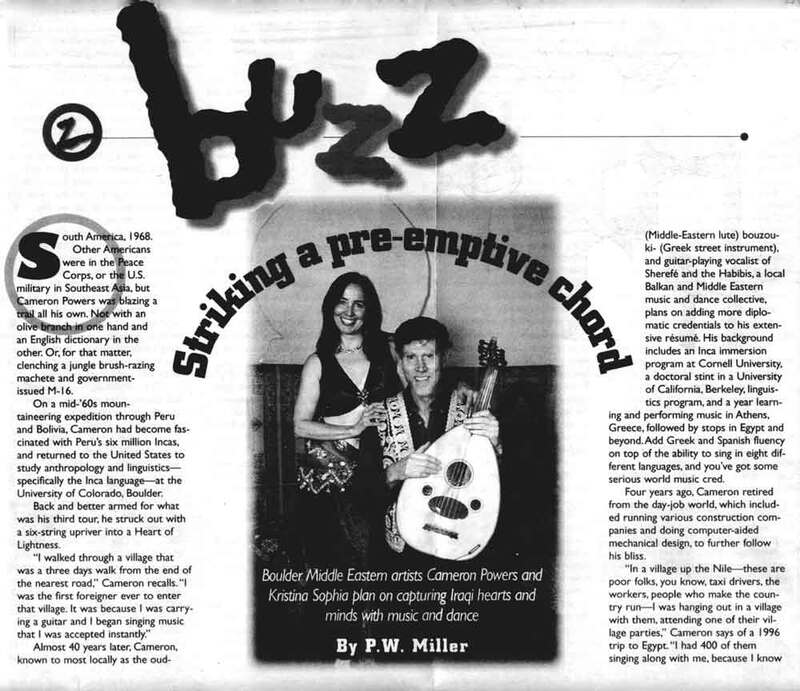 Almost 40 years later, Cameron, known to most locally as the oud- (Middle-Eastern lute) bouzouki- (Greek street instrument), and guitar-playing vocalist of Sherefé and the Habibis, a local Balkan and Middle Eastern music and dance collective, plans on adding more diplomatic credentials to his extensive résumé. His background includes an Inca immersion program at Cornell University, a doctoral stint in a University of California, Berkeley, linguistics program, and a year learning and performing music in Athens, Greece, followed by stops in Egypt and beyond. Add Greek and Spanish fluency on top of the ability to sing in eight different languages, and you’ve got some serious world music creed. Four years ago, Cameron retired from the day-job world, which included running various construction companies and doing computer-aided mechanical design, to further follow his bliss. "In a village up the Nile–these are poor folks, you know, taxi drivers, the workers, people who make the country run–I was hanging out in a village with them, attending one of their village parties," Cameron says of a 1996 trip to Egypt. "I had 400 of them singing along with me, because I know their music. That’s the strongest hit I’ve ever gotten was that trip to Egypt. "I’m doing more good on a people-to-people basis than those politicians and diplomats do reading speeches in their offices, because I’m with the people," he adds. "They’re turning this whole thing into a soap opera," Cameron, talking on his cell phone while driving around Boulder, says of the mainstream media’s coverage of U.S. vs. Iraq. He’s digesting a Friday afternoon falafel and a Fox newscast he consumed at a University Hill restaurant, the din of which he’s left to address his latest destination: Baghdad. According to the plan, Cameron and his partner, Kristina Sophia, will leave Nov. 25 for Amman, Jordan, by way of DIA and Europe. Once there, they’ll apply for visas, which he hopes will be granted in less than 48 hours. Then, they’ll make their way to Iraq’s western-most border. "The first Middle Eastern friend who ever helped me with the Arabic lyrics of a song back in the mid 1970s was an Iraqi," Cameron notes on his website, cameronpowers.com, which includes information on his trip. And since the mid ’80s Cameron has been singing and performing Iraqi songs. 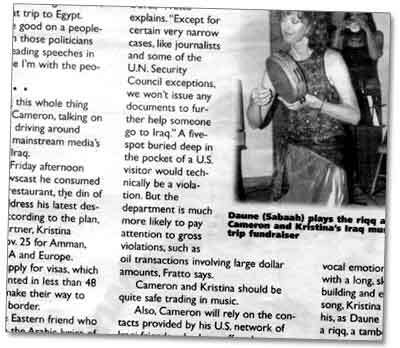 A few months back, before the media boom on the U.S.-Iraq standoff, Cameron was planning on a goodwill trip to Egypt, and perhaps Syria and Jordan, to show the Arab world he loved their music and people. "Then it just struck me," he explains. "I should just go to Iraq and the West Bank and Gaza and sing with those guys that are in the real hot spots. It doesn’t mean that I’m trying to support any particular government. I just find that these people who are under such pressure to be such beautiful, friendly people." Besides possibly being caught in the middle of a war zone, there are other risks. Criminal penalties for violating the Iraq sanctions include, but are not limited to, up to 12 years in jail and $1 million in fines, according to U.S. Department of the Treasury spokesman Tony Fratto. "For anyone traveling to a country where there are travel restrictions, like Cuba or Iraq, what’s important are financial transactions related to travel," Fratto explains. "Except for certain very narrow cases, like journalists and some of the U.N. Security Council exceptions, we won’t issue any documents to further help someone go to Iraq." A five-spot buried deep in the pocket of a U.S. visitor would technically be a violation. But the department is much more likely to pay attention to gross violations, such as oil transactions involving large dollar amounts, Fratto says. Cameron and Kristina should be quite safe trading in music. Also, Cameron will rely on the contacts provided by his U.S. network of Iraqi friends, who have offered to set him up with their family and friends in Baghdad. "I really just want to be in the restaurants, on the streets, and just play the way I have in Morocco and Egypt," he says. "Let fate determine where the connections will form, because it’s so easy when you play their music." "Please take off your shoes, unless you can float," reads the sign on the front door. Other than the note, and the pile of shoes in the doorway, the first thing Cameron and Kristina supporters notice when entering the posh north Boulder abode is the small table bearing a donation bowl and CDs for sale. It’s later that Friday at the duo’s Iraq music trip fund-raiser, hosted by a friend. While some mingle by the large kitchen sampling hummus and talking current events, others of all ages lounge about the living room beneath now-dark skylights or in front of the fire. Cameron, a gentle, slender giant in his red- and black-patterned vest, silver-framed glasses and gray hair, towers over Kristina, to his right, and percussionist Daune (Sabaah), to his left, both beautifully adorned in sensual gypsy-style belly-dance outfits. He explains the first song–one, appropriately, from Iraq entitled "Fogi Naheo," about a 16-year-old boy from a village outside Baghdad who consults a village priest on lost love. "The boy, singing, compares the beauty of his love object’s cheeks to the moon," Cameron explains. "And in the song, the lights of Baghdad are mentioned in the distance." Heads stop bobbing and eyes open only after the song ends to applause. Next stop, Lebanon, and Khalil Gibran’s "A’tini Nay" ("Bring the Flute") for which Cameron plays the flute-like Nay, followed by guitar. Then Greece. Followed by Egypt, care of a song written for the goddess-like Um Kolthoum, on which Cameron employs mystical Middle Eastern quartertones. Cameron and Kristina, who met a few years back through singing circles, are neither soldiers of the U.S. Army’s Psychological Operations Battalion intent on blasting Jimi Hendrix’s "Star-Spangled Banner" across a desert-scape pockmarked with tainted water wells, nor subversives with savior complexes. Boulder activists Elizabeth Roberts, Elias Amidon and Dan Winters, in conjunction with the Chicago-based Voices in the Wilderness pacifist organization, recently departed to protest potential "U.S. aggression" and the long-standing U.N. economic sanctions from inside Iraq, ostensibly willing to protect Iraqi civilians from a potential U.S.-led invasion. Cameron and Kristina are just worldly, a bit like Palestinian oud and violin player Nabil Azzam–a good friend of Cameron’s–who has thawed the world’s worst differences through musical collaboration. "In my heart, I support the anti-war movement and the people who are going over to Iraq right now or to the West Bank or Gaza to be human bodyguards," he says. "But what I do in my life is something a little bit different. It actually creates a connection on another level. It’s a music and dance level, with people. "The same thing that the mystics and the yogis say about meditation is actually very accessible through music and dance," he adds. "In other words, there’s a space beyond words that’s very accessible. When you’re in that space, then there is no duality. There is no ‘them’ and ‘us,’ and everyone dissolves into unity." He says, "The only problem I have with staying for along time is that things tend to fall apart back here if I’m gone for too long. I have an 87-year-old mom in my house that I care for. I have a care-giving team together, but I have to run all the financial stuff. I have two kids going through school.